It is an established fact now that the first five years of a child’s life are the most important ones. It is the time when his personality and intelligence level are determined. 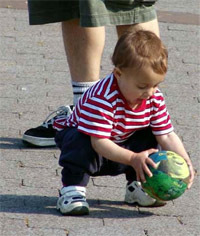 The child’s brain is a lot more active and alert than an adults is, forever grasping new skills, language and methods. Recent Brain research shows that an infant is born with over 100 billion neurons. These neurons last us a lifetime, since no more neurons are created later. During the early life, the neurons form ‘connections’ which is basically the wiring of the brain. This wiring determines the maximum potential of an adult individual. The number of these ‘connections’, or synapses, can vary as much as 25% depending on the early experiences a child goes through. This is also known as ‘use it or lose it’ principle of the brain. That is, the more your child uses the brain to understand and grasp new experiences, more neurons would be used to make the pathways of intelligence. The rest of the neurons are lost forever. It is therefore, important , that parents and teachers recognize the critical importance of these years and stimulate the child accordingly. Stimulation, however, does not means incessant bombardment of random information on the child, which is invariably done in the later years. So, don’t assume that a 4 year old who knows the capitals and flags of all countries is necessarily a future genius. Stimulation, at this stage, means exposing your child to different environments, letting him be, and answering his questions in all honesty and detail. He’ll pick up more this way than through a parental monologue. So, You tell him that while monsters don’t really exist, aliens might, and dinosaurs did. He’ll understand as much as he needs to. Do not generalize all 4 wheelers as cars. A 3 year old can differentiate between different models and makes of cars, if he has been given the information first. Taking your child out to the zoo, the planetarium, the park, to a relatives’ place for summers, to different cities and cultures is a far greater teacher than LKG-UKG combine. Just because she won’t remember that specific trip ten years hence doesn’t mean that she will gain nothing from it. The idea here is to provide the kid with varied environments and letting her pick up the information lying around. Meeting and living with relatives and friends also serve a very important purpose. The child realizes that everyone is different, as she observes that grandma drinks tea without sugar, grandpa uses a stick, and her aunt ties up her hair differently than mom. Do not attempt to recreate your home’s environment when you are visiting another place, the differences in menu and taste, in bed and in chair will teach your child about the different textures of life. Importance of early years is also emphasized by the science of psychology. Dr. Eric Berne, the father of transactional analysis, believed that a child is influenced most by her parents in the early years of life, before her ‘social birth’ . The ‘recordings’ of feelings and conclusions made in these years are always available to the individual for replay later. By the time a child starts school, she is already exposed to all possible admiration and admonishment of the parent, and later parental communication is only a reinforcement of the feelings and judgments made earlier. This points to the need of a young child to be loved and caressed, and not just cared for. In this sense, a nanny or crèche can never take place of parents with time available for their kids. So Preschool is indeed a precious time in your child’s life. Do not shrug it off as something that he’s not going to remember later, and therefore unimportant. Parents and Teachers, working together, can create an environment in which a child can bloom to his or her full potential in later life.